Do you and your business have a “Growth Mindset”? Please say, yes! Then creating a memorable brand should be the top priority. Whether you’re a small, medium or large business, branding is critical for growth. A Brand starts with a memorable and customer-focused logo but goes light-years further. It becomes your driving force, your compass, your core values, your culture, and your identity. Proper and consistent branding will help your business grow leaps and bounds, differentiate you from your competitors, and make you a leader in your industry. But first, what’s the difference between a Brand, Branding and Brand Identity? A Brand is a person’s perception of your business. It’s what they say about you when you are not around. This perception gets influenced by everything you put out in the world in the form of printed and digital collateral. It also gets influenced by the way you answer the phones and respond to emails, by the voice & tone of your ads, and by your overall messaging style. Your Brand is the core, the DNA of your business, it’s all-encompassing and should always speak to your ideal customers in a way that will resonate with them. Branding is the art and science of discovering, creating and implementing your brand through visuals, messaging and interactions. It is the process used to build and amplify awareness and trust in your customers. It requires a growth mindset and a readiness to invest in the future. The Brand Identity is all the tangible elements and touch points of your brand. It fuels recognition, amplifies differentiation, and creates trust and brand loyalty over time. Your brand Identity takes individual elements and unifies them into a holistic system. Some basic examples of brand Identity elements and touch points are: Your logo, business cards, social media posts, hats, sales sheets, invoices, email signatures, packaging design, ‘thank you’ cards, Deck slides, etc… the list can be big or small depending on your needs. What do you think you might need to engage your audience? Oh, and don’t forget the most important touchpoint of your business, your branded & user-centric website. This is so important that it is almost not considered a touch point but more of your online presence. Why should you invest in branding? Branding makes it easier for your customers to buy, easier for your sales force to sell, and easier to build your brand equity(reputation). The best Brand Identity systems embody and advance your company’s culture and reputation by supporting your desired perceptions. Each touchpoint becomes a consistent symbol of the company’s core values and legacy. We live in a branded world and you need to seize every opportunity to positively position your company in the mind of your customers. Making sure your company is top of mind when clients are ready to purchase is what Branding is all about. Hope you are not too overwhelmed. Thinking about creating a new Brand or Re-Branding can seem like a daunting task. But don’t fret, if you are really ready to grow your business and level-up your brand, we can help. 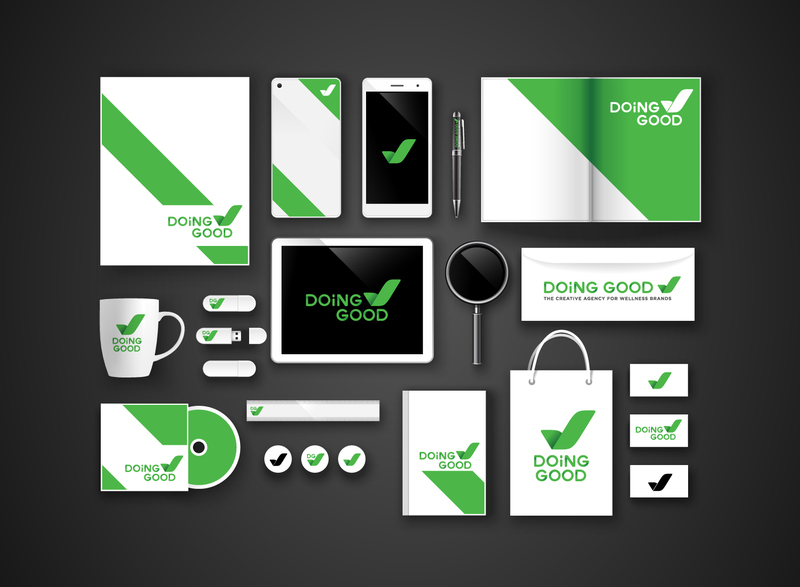 Here at DOiNG GOOD we specialize in helping Wellness businesses with Brand Strategy, Identity Design, Web Design, and Digital Marketing Frameworks. Drop us a line if you have any questions. We love to hear about new amazing projects and how we can synergize to grow your business.